There are "tip-over" guards, designed to protect your expensive plastic in the case of a minor parking lot fall. And there are sliders, designed to protect your bike in a crash. 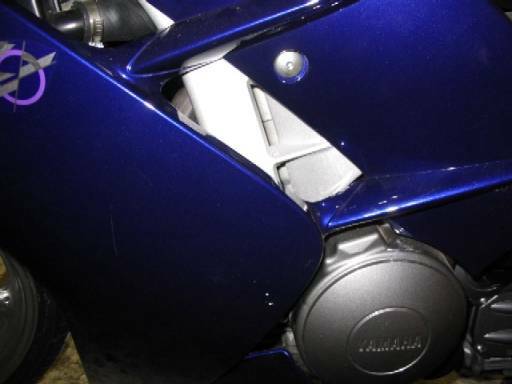 I wanted crash protection, so I looked at the sliders available for the FJR. In the FJR community here are two major slider makers for the FJR, Moko and R&G. The Moko's use a bracket, offsetting the slider from the mounting bolt to a slot in the faring, thus requires no drilling. These are high quality sliders, but are spendier and sit higher on the FJR than the R&G sliders. I liked the mounting position and price point of the R&G sliders. And since I have no qualms about drilling holes in my plastic, decided to go with the R&G sliders from Bike Johnny. Bike Johnny is an excellent vendor of FJR accessories in the UK. 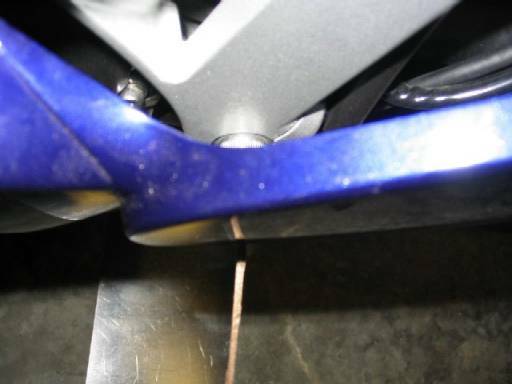 It took about two weeks to get the sliders and they supplied a template that allows you to drill your fairing without removing it from the bike. There are two methods that can be used to install the sliders. You can use the template, or you can remove the fairing completely. I used both methods, using the template for the right side and taking the fairing off for the left side. Small drill bit: for pilot hole. Unibit or Step Bit: I used two bits, only because I already had the smaller one. The larger one goes up to 1 inch which works out to a hair over 25mm (the required diameter for the sliders). 10mm allen head bit: to remove the existing engine mount bolts. 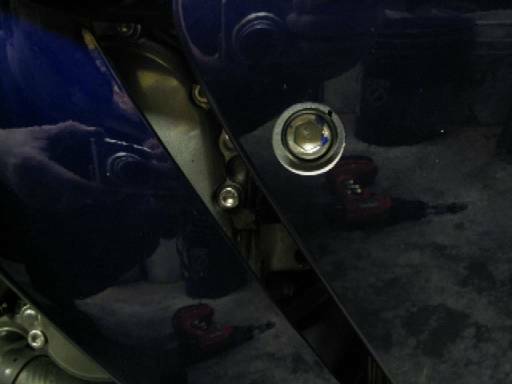 10mm wrench: to turn the 10mm allen head bit and remove the engine mount bolts without removing the fairing (there isn't room for a ratchet between the fairing and mounting bolt). 19mm socket: to install the new engine mount bolts supplied. Anti-seize compound. 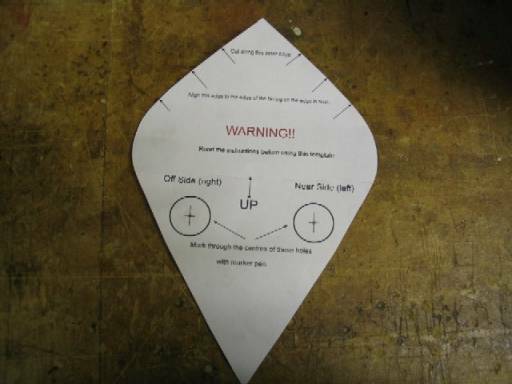 Marker or scribe to mark drill hole on fairing. 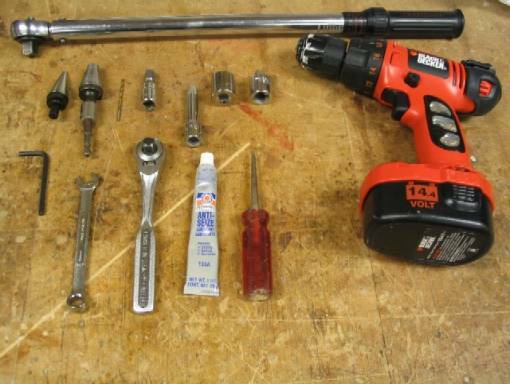 Torque Wrench that can torque to 29 or 40 ft/lbs (lower setting if using anti-seize compound). 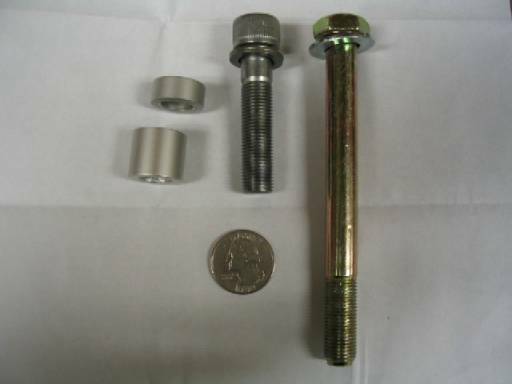 4mm allen wrench for fairing fasteners. Here are the parts supplied with the R&G Sliders. Notice the left and right spacers are different sizes. The larger spacer goes on the left side. This is the template supplied by Bike Johnny. The same template is used for both sides. I used the template on the right side. You line up the arrows as indicated to the edge of the fairing, and mark the pilot hole location using a scribe or marker. 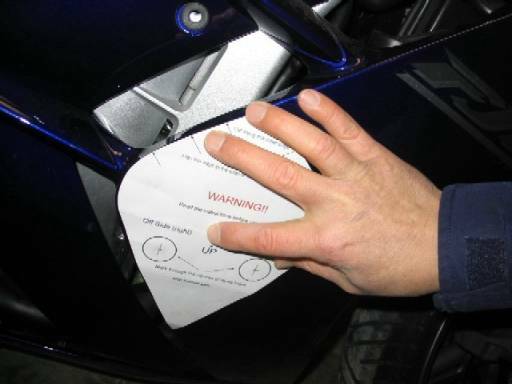 By using the template you do not have to remove your fairing, however, the template is intended as a guide only. That is made very clear in this warning. 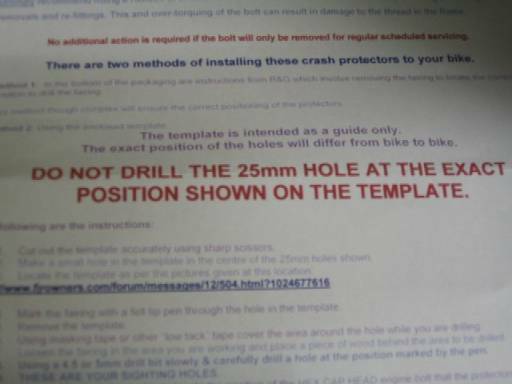 DO NOT drill the 25mm hole without drilling a smaller pilot hole first! Doing so will seriously ruin your day. The template is not going to put you dead center in the mounting hole. After you drill the pilot hole take a small rod or other small, straight object and insert it into the hole until it hits the engine mount bolt. This will guide you to the correct location to start drilling using the Unibit. As you can see above, my initial pilot hole was a little high and aft of the actual engine bolt. So, I drilled a second pilot hole before using the Unibit. By inserting a rod into the pilot hole you'll get a good idea of how close you are. You may need to drill another pilot hole at this point. Once your pilot hole is centered, use the Unibit to continue drilling the hole larger a little at a time, stopping occasionally to make sure your centered on the mounting bolt. When your done the hole will look like this. The instructions mention sanding the hole after drilling, but I've not found this necessary when using the Unibit as the bit cuts very smooth holes. The other nice thing with these bits is you can 'move' the center of the hole while drilling, so if you're a little off you can make corrections as you drill. Next remove the existing engine mount bolt using the 10mm allen bit (above on left). There isn't enough room between the bolt and the fairing to get a ratchet and allen bit, so I used the allen bit and a 10mm wrench to loosen it. Apply anti-seize to the new bolt; insert the bolt through the slider, small spacer and torque to 29 ft/lbs. This is the suggested torque setting if using anti-seize compound. If you don't use anti-seize the dry torque value is 40 ft/lbs. 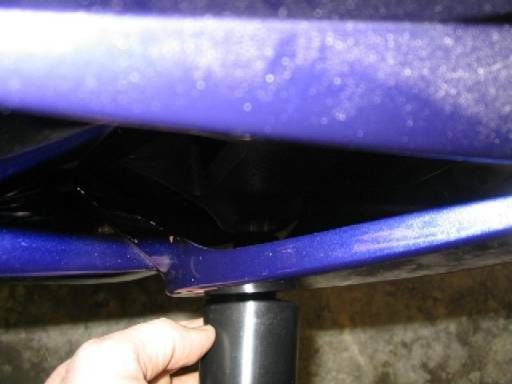 Do not use the dry torque value if using anti-seize as you will over torque the bolt and damage the threads. For the left side I wanted to try the alternate method to see which was easier, so I took the fairing off. David Butterfield did a good job with that in his write-up on installing the MOKO's, so I won't describe fairing removal here. I used one of my wife's muffin pans to hold all the little fasteners, labeling each muffin hole and keeping them grouped together by location. Before I removed the fairing I used the template to drill the pilot hole. This was not necessary; I just wanted to know how close the template was on the left side. After I measured and marked the hole using the alternate method I compared the two holes. As you can see, the template was off by a good ½ inch! Good thing the hole will be an inch in diameter. Here's the right side with the fairing removed. 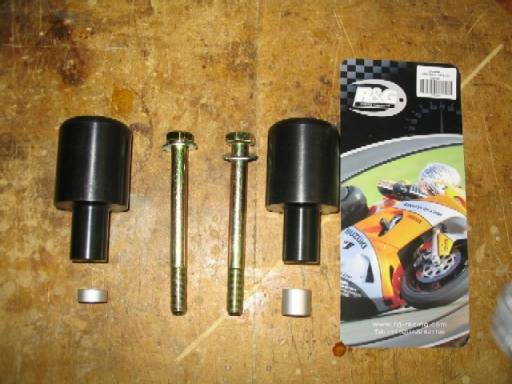 Use the 10mm allen bit to loosen the engine mount bolt. 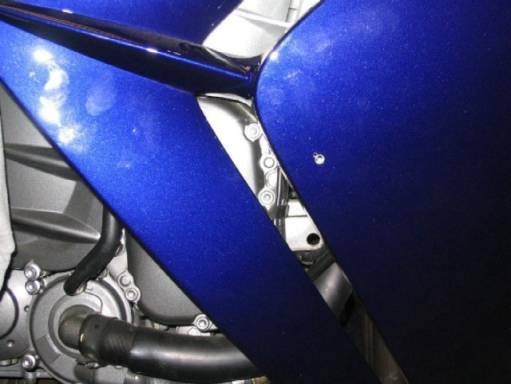 Loosen the bolt until it will touch the inside of the fairing. 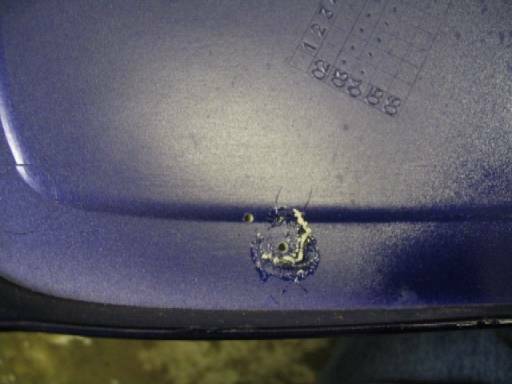 Put some grease, white paint, or your choice of marking substance on the end of the bolt. Reinstall the fairing, only installing a couple of fasteners. 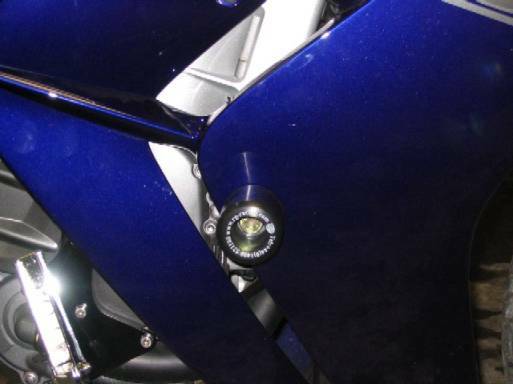 Then push the fairing in while pulling out the bolt to make sure you get a good impression on the inside of the fairing. Remove the fairing. 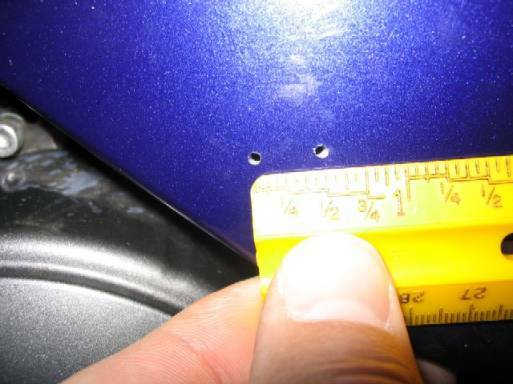 Mark your pilot hole from the marking on the inside of the fairing. Once the pilot hole is drilled, reinstall the fairing to make sure the pilot hole is lined up with the engine-mounting bolt. At this point you can remove the fairing again and drill the hole with the fairing off or leave it on and drill. I left the fairing in place, as I wanted to double-check the centering as I drilled. Here's the fairing reinstalled with the two pilot holes drilled. 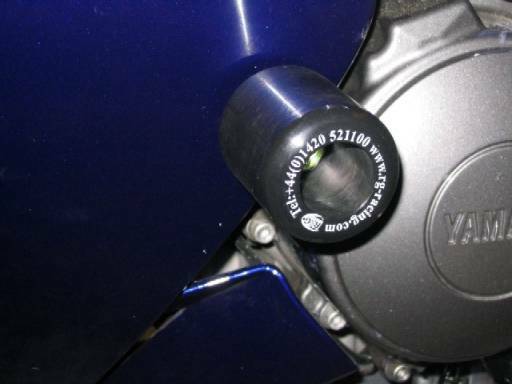 The upper hole was drilled using the template and the lower using the engine mount bolt to mark the proper location. Continue to drill the hole using the Unibit as described before. Take your time and stop occasionally to double-check your centering. 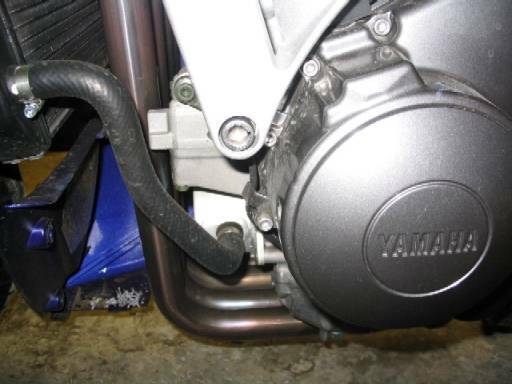 Remove the existing bolt, apply anti-seize to the new bolt, insert through slider, spacer and torque to 29 ft/lbs. Here's a picture of the slider installed in the left side. I was a little apprehensive about drilling holes in the fairing, but with the proper tools and some patience it was a relatively easy install. Copyright © 2005, by H. Marc Lewis and Derek Dickson. All rights reserved.